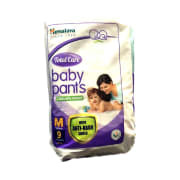 Himalaya Total Care Baby Pants contain Yashada Bhasma and Aloe Vera as major ingredients. Yashada Bhasma & Aloe Vera: Inhibit the growth of microbes and prevents diaper rash by forming a protective anti-rash shield and reducing the harmful enzyme activity. - To wear gently pull up the diaper like a pant making sure that the waist area is not folded over. - To remove simply pull the pants down by simply tearing both the sides. A licensed pharmacy from your nearest location will deliver Himalaya Total Care Baby Pants L. Once the pharmacy accepts your order, the details of the pharmacy will be shared with you. Acceptance of your order is based on the validity of your prescription and the availability of this medicine.